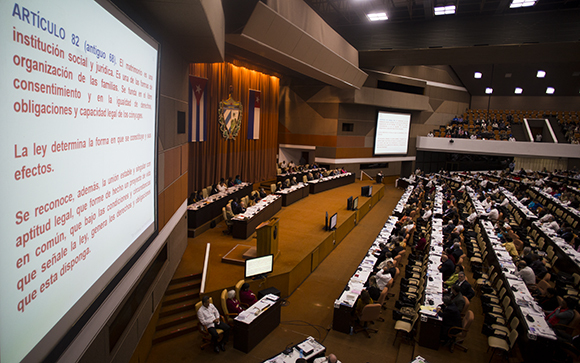 The new Cuban Constitution was affirmed by 87% of the country’s voting public on February 24, 2019, following an extensive process of public debate and popular participation. It is largely an aspirational document that seeks to move the country forward, economically and socially, while retaining socialism as the ideology of the revolution. The document replaces the 1976 Constitution. Both documents declare that Cuba is to remain a socialist state guided by Marxism-Leninism. This earlier version was subsequently amended in 1992 to reflect radical changes adopted by the government after the fall of communist regimes in Eastern Europe and the Soviet Union, and the severe hardships that led to a “Special period in Time of Peace.” Along with these later amendments, the 1976 Constitution codified the country’s government structure and has defined the system that has operated there for the last 43 years. As the decades have passed, the need for constitutional change has become increasingly clear. Cuba and the world have changed in significant ways since the turn of the twenty-first century. The most obvious of these is Cuba’s leadership. The revolution’s founder and leading figurehead Fidel Castro, who led the island nation in the face of unyielding U.S. hostility for almost five decades, died in 2016. His brother, Raúl, who assumed the presidency in 2008, stepped aside ten years later in 2018. The new president, Miguel Díaz-Canel, was born after the triumph of the revolution and represents a new generation of leadership that is struggling with a global economy in which Cuba faces the continuing US economic embargo as well as a need to adjust its economic policies to prevailing conditions. Díaz-Canel and the new generation of leaders in Cuba do not have the automatic support of the people equal to that given to Fidel Castro and those who led the revolution. Cubans want the government to address serious economic problems and hope the policies outlined in the new constitution are successful. If so, Díaz-Canel and the new generation of leaders will gain greater credibility among Cubans. But there are other, more subtle factors at play. The current economic environment is chaotic. Cuba cannot export enough to earn sufficient hard currency to import food, machinery and fuel. This has resulted in hardships such as a declining availability of certain consumer staples. For most of the months of February and March 2019, for example, Cubans could not find olive oil or powdered milk in stores. But there is also a desire among the public for societal change in a wider context. Cubans seem to demand more economic opportunities outside state employment and greater political opportunities for decision-making within the revolution. It was these aspirations that primarily drove the process of developing the new constitution. This process has been lengthy and complex, but also characterized by considerable public engagement and contribution. The first draft was made available to the entire Cuban population in 2018. 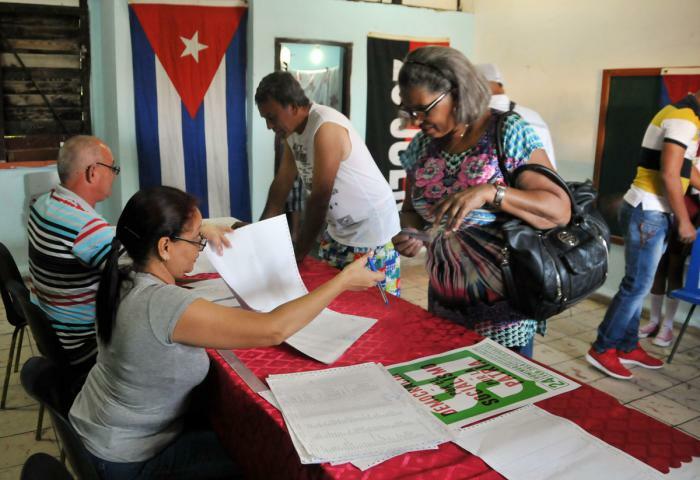 Over many months, Cubans read the document and made a total of 780 suggestions and 9,600 proposals. Many of these were incorporated in the final draft, which was presented to the Cuban electorate on February 24. Approximately 87% voted in favor of the document and 9% voted “No” (with 4% of ballots left blank or damaged). The previous constitution had been approved by 99% of those who voted. While the 87% “Yes” vote still demonstrates strong support for the government, it may also suggest that more Cubans felt that they could express their opposition in 2019. Amongst those doing so was the Cuban Patriotic Union (UNPACU) – a dissident organization supported by the US – who used the “No” vote to publicly challenge the government. Around 20 members were arrested before the election. One of the most dramatic and contested aspects of the process for approving the new constitution was the language regarding marriage. The 1976 Constitution states in Chapter III, Article 35. (1) “Marriage is the voluntary union of a man and a woman who are of legal age.” In an attempt to reduce discrimination against LGBTQ Cubans, the draft constitution for 2019 changed the definition in Chapter III, Article 68 to: “Marriage is the voluntary union agreed upon by two persons who are of legal age.” The bishops of the Catholic Church and some of the Pentecostal Protestant pastors objected vehemently to this change claiming it countered biblical teachings. The irony in this opposition is that these religious leaders had earlier requested changes to aspects of the constitution that discriminated against people of faith. They organized opposition demonstrations, wrote to government officials and preached in church that congregants should oppose the new constitution and vote against it. There remains in Cuba social opposition to gay marriage and the government eventually changed the wording. In the final document, Chapter III, Article 82 states: “Marriage is a social and legal institution. It is one form of family organization. It is founded on the free consent and equality of rights, obligations and legal capacity of those so joined.” While this description did not restore the earlier wording that marriage is between a man and a woman, the constitution stipulated in “Temporary Measures,” that within two years the National Assembly will initiate a process of consultation with the Cuban people and a referendum on the Family Code in which the definition of marriage will be determined. As with the decreased majority voting in favor since 1976, this tension over one article out of hundreds suggests that there is a growing willingness of the Cuban public to speak out and by the government to seek compromise. Clearly, Cuban citizens can and do affect change within the system. The 2019 Constitution reaffirms the inviolable nature of socialism in Cuba and the leadership of the Communist Party. However, there is a shift in identifying fundamental principles that guide the revolution. The 1976 Constitution stated that Cuba was guided by Marxism-Leninism and the ideals of José Martí. In 1992, the amended constitution reversed the order and said Cuba is “Guided by the ideology of José Martí, and the sociopolitical ideas of Marx, Engels, and Lenin.” The 2019 constitution now claims to be guided by the “example of Martí and Fidel and the ideals of social emancipation of Marx, Engels and Lenin.” Note that in each successive version Marx and Lenin get pushed further back in order. This change suggests an evolving sense of Cuban socialism. To be sure, the Cuban government is not abandoning the socialist goal of using the resources of the country and its economy to benefit all Cubans. However, beginning in the 1990s the Cuban government began a series of economic changes that departed significantly from Marxist-Leninist economics by ending restrictions on farmers’ markets, self-employment (cuentapropista), tourism and investments by foreign companies. At the time, Fidel and others claimed these were temporary measures, and some of them were later restricted or discontinued. By 2011, After Raúl became president, there were additional changes regarding ownership of property, reduction of state employment, taxi regulations and self-employment, policies that reflected a weakening of strict Marxist economics. Now, with the 2019 constitution and the acceptance of private property, even as ancillary to the economy, the Cuban government is further reducing the Marxist nature of the economy in favor or some mixture that, while not capitalist, does indicate a weakening of the original focus of state control over all aspects of the economy. By placing Marx lower than Martí and Fidel, the new constitution indicates these changes mark a shift toward a socialist economy that differs from earlier Marxist-Leninist economic theories. The organization of the government will also be subjected to several significant changes under the terms of the new constitution. It reinstitutes a division between head of state and head of government that had been a part of the 1940 Constitution that governed Cuba until the 1959 revolution (and continued until the 1976 charter). Under the new constitution, the President of the Republic, chosen by the National Assembly, will serve as head of state. It stipulates that he or she must be less than 60 years of age when first elected and can serve for two consecutive five-year terms. The new position of Prime Minister, meanwhile, will serve as head of the Council of Ministers and carry out the day-to-day functions of government. The Prime Minister will be chosen by the president and elected by the National Assembly for five years by majority vote. Provincial administration will also change, with the appointment of governors who oversee provincial councils and city mayors heading municipal assemblies. The biggest change in the new constitution is in Chapter II, Title II, Article 22, which identifies several forms of property ownership, including “socialist,” “cooperative,” “private” and “mixed.” “Socialist” refers to ownership by the state in the name of the people and includes most businesses and industry. Cooperative property is owned collectively by members. Private property is now recognized to be held by individuals, including Cuban citizens or foreign businesses, and is relegated to a complementary role in the economy. This legal recognition of private property is a radical departure from previous prohibitions on private ownership – although it should be noted that the government has relaxed these restrictions over the years. The Cuban government faces difficult economic realities and an economic embargo by the United States that has restricted its ability to develop a more stable economy. Recent restrictions by the Trump administration have reduced the ability of U.S. residents to travel to Cuba, access by Cubans to visas and threatened retaliation of foreign firms that invest in Cuba. The 2019 Constitution will not immediately solve Cuba’s fundamental problem of anemic economic growth of 1.2 percent. Nor does it address the issue of a dual currency that has led to greater inequality among Cubans. But it is a first step in what could be a transition to a mixed economy that will preserve the benefits of the revolution while allowing Cubans increased economic opportunities. The Cuban people want change within the country’s socialist structure and the 2019 Constitution provides the foundation. Now, it is for the Cuban government and the Cuban people to turn these expressions of change into something concrete.